This is one of the biggest loss to lottery scams that we have seen. How could anyone continue to pay and pay so much money without even realising something is wrong. Greedy Pigs Get Slaughtered! taxes and other fees on the winnings before they can collect in full. Authorities were notified of the scam on April 24.
contact the FBI’s Internet Crime Complaint Center at www.ic3.com. 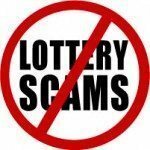 Why are people still tricked by lottery scam? Please see our posts here: Lottery Scam. As we have said, the Scammers will continue to “Milk you Dry” as long as you still believe it is a scam. This victim lost $500,000, and amount equivalent to the smallest lottery around the world. But the real winner is the SCAMMER!